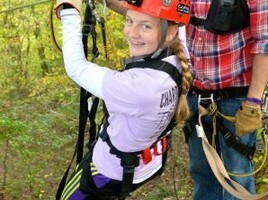 Tree Frog Canopy Tours - Explore the longest, highest, fastest zip line canopy tour in Ohio! Explore the longest, highest, fastest zip line canopy tour in Ohio! Click "Schedule Your Visit" to check reservation options and reserve your trip today! Our 2 1/2 to 3 hour-long, zip line canopy tour leads adventurers through the tree tops by means of zip lines, sky bridges, and rappels connected to platforms suspended in the tree tops. Whether you are a nature lover, adventurist, or an adrenaline junkie you will not want to miss what we have to offer here at Tree Frog Canopy Tours! Unlike other ziplines, our Night Rider Club includes our ENTIRE course! So get your night vision ready and experience the Forest from a new perspective! IN COMPLETE DARKNESS!! Â Only the glow from your glow sticks to light the way. Come on...WE DARE YOU!